You may recall that I described my sitting of Part 1 as not unlike being kicked in the head for six hours by the entire All-Blacks team. It went so badly that, if I had passed, I’d have presumed I was hallucinating and then I’d have been tempted to ask for a re-count. And if I had passed, it would have been wholly on luck and then I might always have felt that by not having to learn it again properly, I’d left great holes in my education — some holes are all right, I suppose, I wouldn’t have minded passing the biochemistry parts on luck, but for example, hearts: it turns out that I don’t really know much about those, and I should, really, because most people have got one. This was predictable. This was so predictable that when it finally happened, I wasn’t even really terribly disappointed. I’m dusting off my copy of Kalra and my subscription to Pastest. The next sitting is in May. 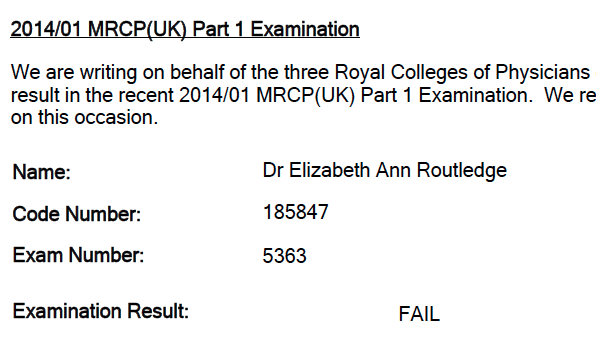 This entry was posted in Blog, Medic and tagged exams, medicine, mrcp, of course there are still exams, toddler doctor. Bookmark the permalink. Great attitude – onwards and upwards! And again… lots and lots of good luck to you. Also, sprinkles of patience and persistence. My sympathies – and may you do fabulously the next time around! Well, at least it wasn’t a surprise. Onwards and upwards indeed.